Begin your yogic journey on this introductory retreat - become immersed in the beauty and simplicity of a yogic lifestyle on our signature retreat. Use it as a stepping stone to our 4 week Yogic Life Skills Retreat. Give yourself the space and time to learn more about yourself in this holistic and practical introduction into the Yogic Lifestyle. Experience bringing together different yoga and meditation practices for an enhanced level of understanding. Receive a broad range of tools to take away with you in order to start supporting yourself through the hustle and bustle of life. 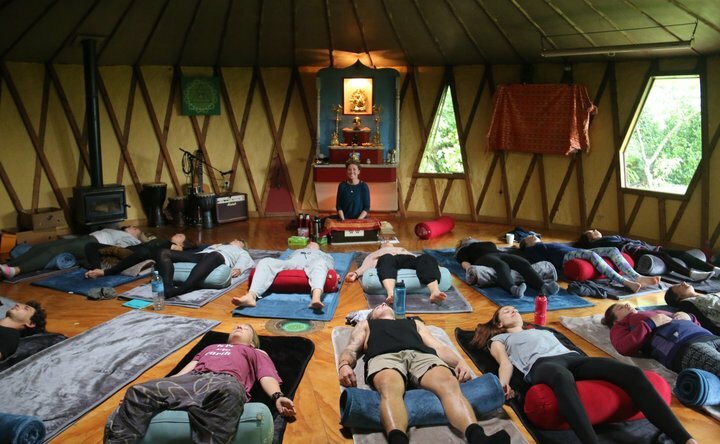 Anahata Yoga Retreat is based on the principles of an ashram, which is traditionally a place dedicated to personal transformation through regularity of yogic practice and self enquiry with the support of a community of aspirants. The rhythmic environment helps an individual to find more clarity and peace as well as form healthy habits and bring yoga into daily life. An ashram provides the foundation for self growth and development of inner potential. The resident community practices acceptance, compassion and equanimity in the different activities in life, through the yogic principles of karma yoga meditation in action and Seva selfless service. All visitors are welcome to join in these practices. A healthy lifestyle and environment go hand-in-hand. Sustainable living is intrinsic to the yogic tradition. At Anahata we practise energy efficiency, water conservation and waste management. We use solar power, composting toilets and unique eco-friendly earth and straw buildings. We are also caretakers of the ecologically significant flora and fauna of Golden Bay with an active interest in conservation in the region. Our organic garden is an ongoing project. It is being developed along Permaculture Design principles and is largely bio-dynamic. The garden produces a range of herbs and vegetables that are used daily in our delicious vegetarian meals. All scraps from meals are used to make compost or fed to our worm farms, where the worms happily transform bits of fruit and veggies into worm castings, which are then used, along with the compost, to mulch trees and the garden. Anahata is off the electrical grid and relies on solar power, minimizing impact on the environment. Other alternative power options to complement our solar power is a future project. At present, we have two different types of straw bale structures and an earth yurt. These buildings have excellent insulation, staying warm in the winter and keeping cool in the summer. They were also built using primarily natural materials. Anahata uses primarily composting toilets, helping to minimize water usage. The compost from these toilets is used to mulch trees around the property. We use biodegradable, environmentally friendly cleaners. We ask that guests also use biodegradable soaps, shampoos and laundry detergent when visiting. 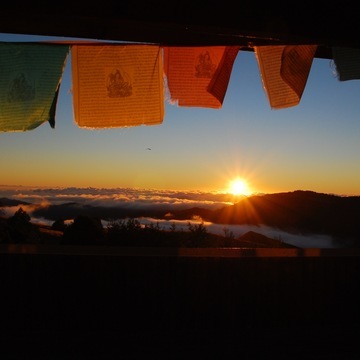 At Anahata Yoga Retreat we strive to maintain the natural beauty of the landscape and provide a place where our guests can retreat from the stress and stimulation of work, modern technology and the impact of city life. Anahata aims to minimize electromagnetic frequencies (EMF) by limiting cell phone use, consolidating computer use to specific areas and choosing low EMF options wherever possible. Anahata is committed to caring for the land and preserving old growth indigenous forest that covers most of the property, taking into account the environmental impact of any new buildings or developments. Please come prepared for a yogic environment. Our routine is simple but well tried and tested in retreat centres and ashrams around the world. 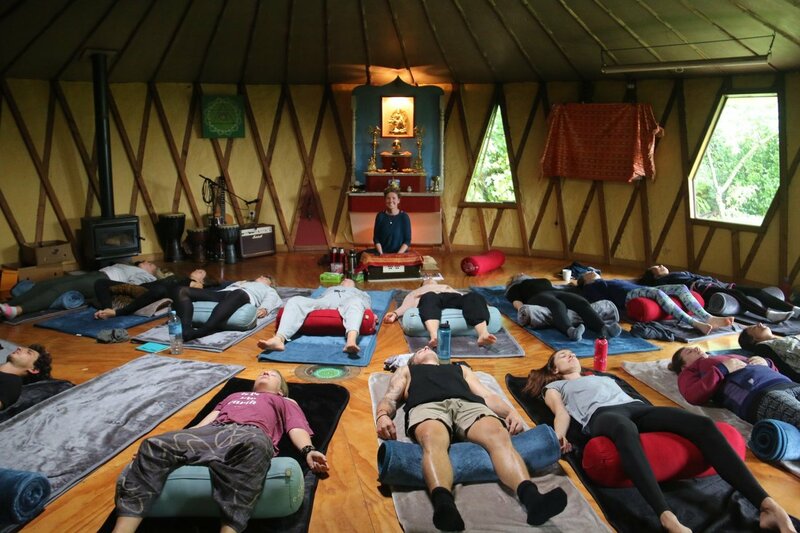 While participation is encouraged, guests may take part in as much or as little of the daily programme at Anahata as they feel is appropriate. Our weekly rhythm includes yoga sessions to stretch the body and mind, a daily relaxation practice to dissolve tensions & active or sitting meditation techniques to gain deeper insight. 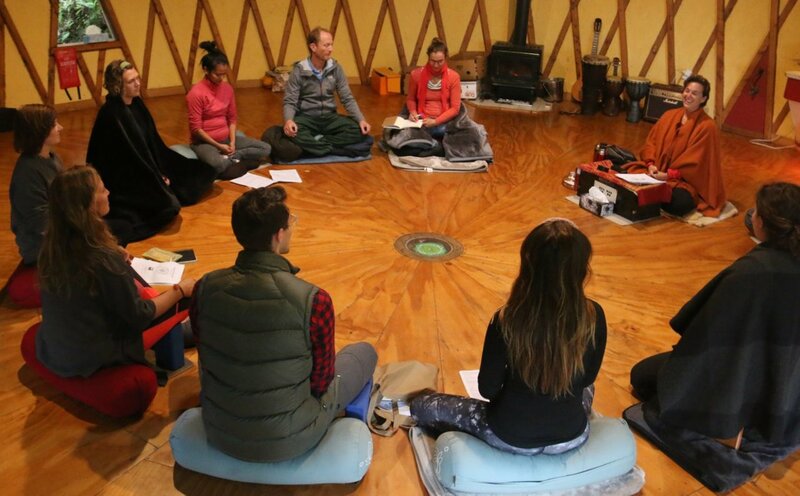 All guests are invited to participate with Anahata’s residents in the Morning Circle and Karma Yoga (moving meditation to observe and cleanse the mind and emotions) from 8:30am to 9:30am. Afterwards, there are classes, free time or more Karma Yoga. Food nourishes us and provides our physical body with the energy it needs to go about its daily activities. 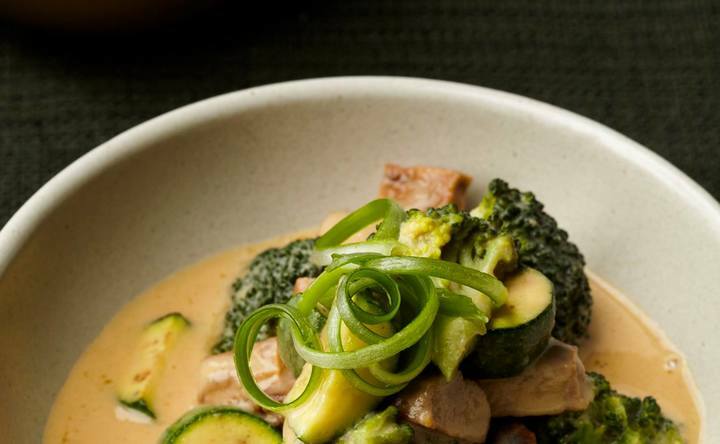 All meals provided are vegetarian – simple, nutritious & satisfying. Much of our organic food is sourced from local growers or picked fresh from our garden, which is developed along permaculture design principles. Breakfast: a light meal to break the fast from the previous night. Lunch: the main meal of the day, when our digestive fires are the strongest. Dinner: a light meal to ensure that all food is completely digested before going to sleep. The water at Anahata is from a pure mountain spring and is absolutely safe to drink. The following dietary requirements incur an additional charge: Gluten Free, Dairy Free and Vegan. 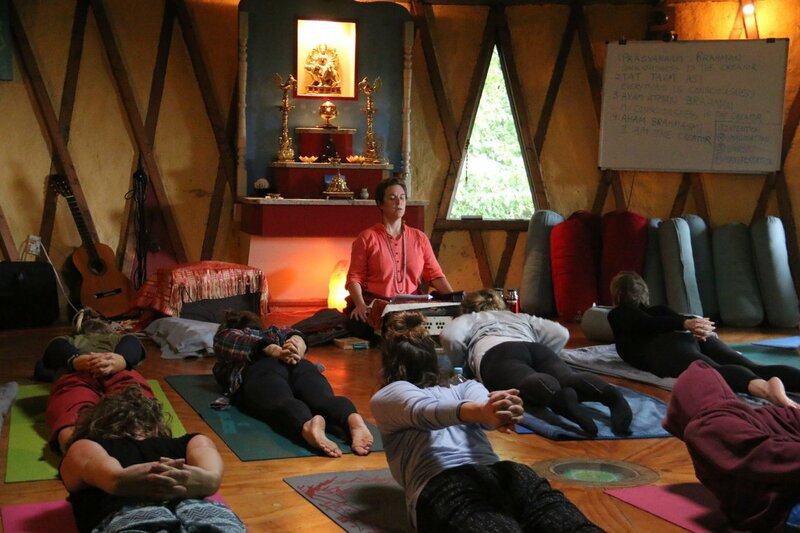 $15 for a standard retreat and $25 for a retreat 10+ days and $10 per week for Karma Yogis or Yogic Life Skills retreat. Eat to live, don’t live to eat. The kitchen is not to be used for personal cooking. However the option of cooking alongside one of the retreat residents and learning about sattwic food preparation and prasad is a possibility during your stay if you choose. If you have medically related food requirements or allergies, please inform on booking. Food is not allowed in the bedrooms. We can cater to vegan and gluten free requirements, for other required speciality foods or snacks you may wish to bring your own supply. Please confirm when booking if in doubt. 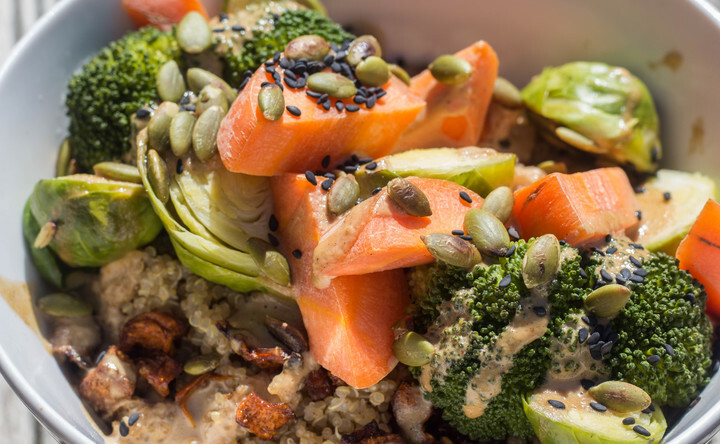 At Anahata, you will get the chance to experience a yogic diet, a vegetarian diet that is based on principles of simplicity, and that supports our being in the process of positive transformation. A proper diet that is pure, simple and as natural as possible is essential for progress in yoga. If one eats pure food, then the system is revitalized again and again. Our state of mind affects the subtle vibration of the food we cook as well as our ability to digest it. In the ashram, we call food Prasad, which is an offering from the heart. Any kind of food that we prepare to offer someone else is Prasad, as is all food that is offered to us. A range of lodging options are available from shared rooms to a private straw bale round house with stunning views of Golden Bay. 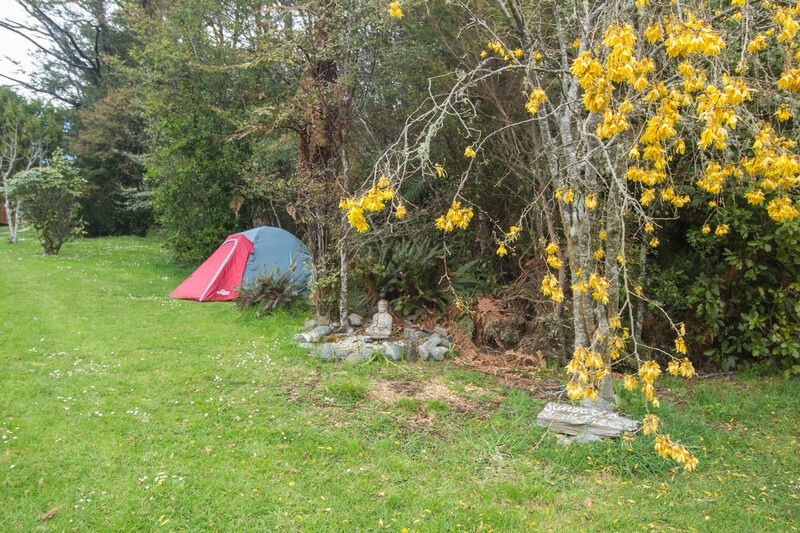 Tent sites and camping are also available. Retreat rates are priced separately and include shared lodging, meals and all programs. 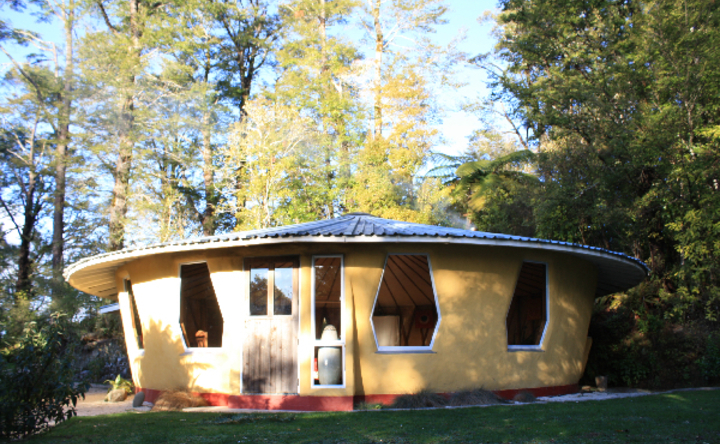 Chakra Guest House – Private Straw Bale Yurt or alternative private room can be arranged for additional cost. Please contact our Office on (contact info blocked) for availability and pricing. You can hire the local MaxiCab Shuttle service. Book online or ring the freephone number or text 0800-MaxiCab (contact info blocked)) to book a taxi service. It is essential to pre-book in advance (limited rural service). 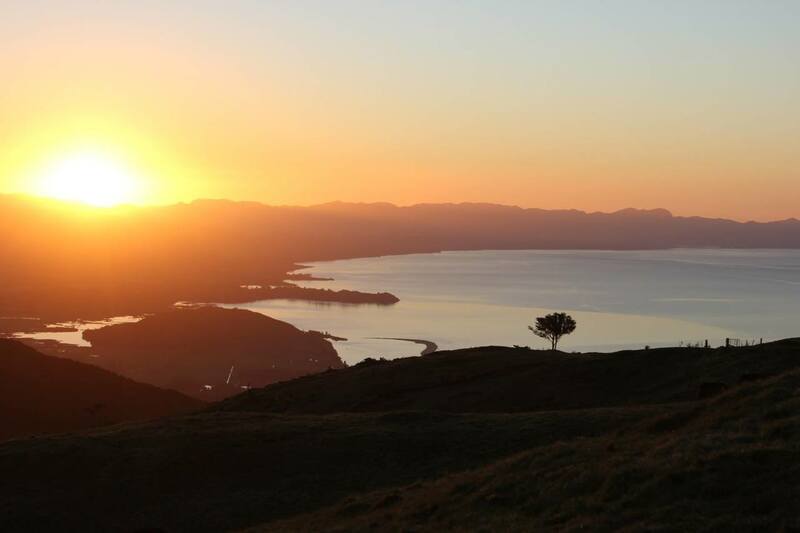 Golden Bay Coachlines offers daily services from Nelson to Takaka departs Nelson daily at 3:30pm, arriving in Takaka at 5:45pm. There is an airport in Nelson, and there is a small airport in Takaka. Nelson is the main national airport for the region and is a 2 hour drive from Takaka. Or fly directly from Wellington to Takaka. Golden Bay Air offers scheduled flights from Wellington directly to Takaka all year.This is a gorgeous flight over Cook Strait and Abel Tasman National Park. 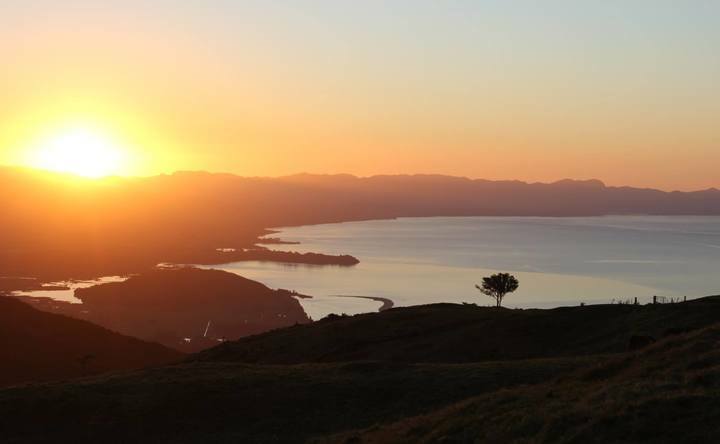 Air New Zealand offers daily flights to Nelson. available between Motueka and Takaka, so best to fill up in Motueka. Stick to the speed limits to avoid traps! After crossing the Takaka Hill from Nelson, you will drive towards and into Takaka. Turn Right immediately past the Visitors Centre (Don’t go through Takaka!). Follow the road to the roundabout at the dairy factory and turn Right. Drive towards Pohara Beach for about 10 minutes. The road curves on a big right and then a big left. You will pass Motupipi School (on left), then take the next turn right at the Clifton ‘+’ crossroads. Turn right at the next ‘T’ Junction at Carlyle Street. Follow this road to the next T-junction and turn LEFT continuing on Clifton Road. As you turn you will see an orange “Anahata Retreat” sign. You will come to a gravel road and a sign saying Bird Road. Follow the gravel road (Bird Road) up to the top of the mountain (7km). You will notice a sign part way up the hill with several family names on it. This is a private driveway/road to their house. Continue on past this drive. There are some shallow fords and various gates. Please leave the gates as you find them (closed if closed). When you are half way up you will come to 2 gates side-by-side. Go through the left gate (not the one going down the hill to thefarm). When you arrive at the top after approx. 30 minutes driving you will see a little sign on the other side of the top gate to the right that says Abel Tasman Wainui Hut. Go through this gate and follow the same gravel/dirt road heading a little left. On your left (a hundred metres or so) you will see a row of big Pine Trees, a house and some gardens. There is an “ANAHATA” sign on the fence to the right of the gate. You have arrived. Welcome to Anahata Yoga Retreat! to the building you see). 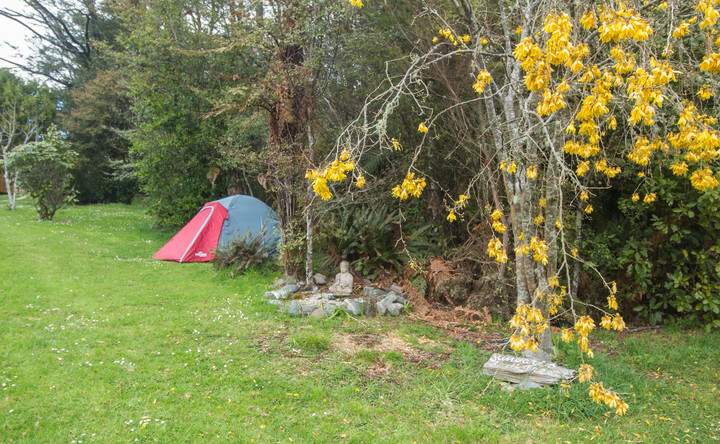 Anahata Yoga Retreat, New Zealand is situated in the midst of native beech forest with spectacular ocean views bordering the Abel Tasman National Park. 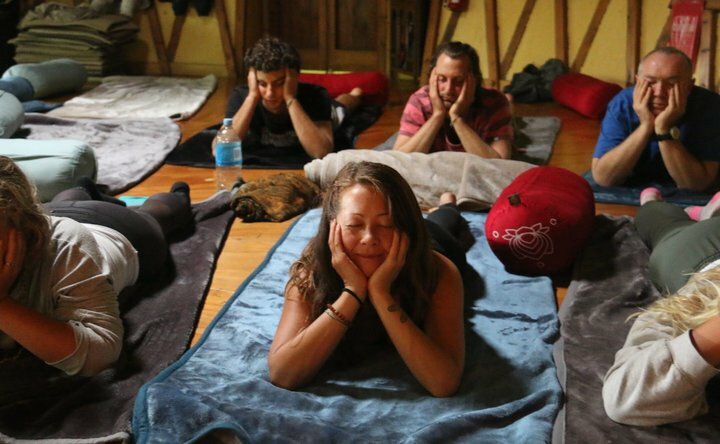 It is a residential eco-­yoga retreat using alternative power, composting toilets, eco buildings and nutritious organic vegetarian meals.Anahata Yoga Retreat is a supportive, inspiring and dynamic environment that welcomes everyone regardless of age, background and level of yoga experience. 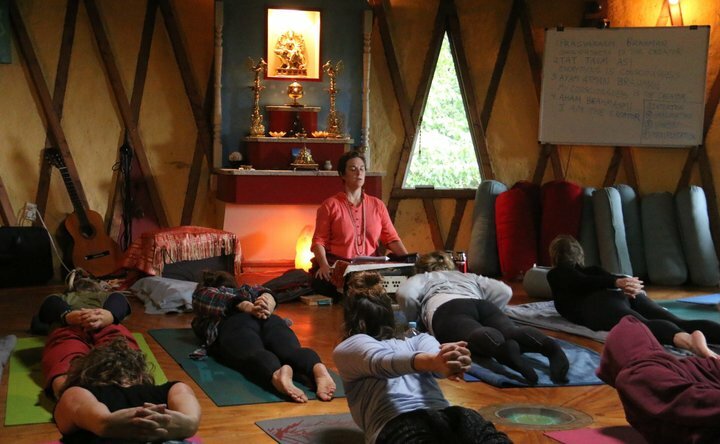 We live, share and teach the yogic principles.Our integral approach provides inspiration to enrich your life as well as valuable skills to bring into your day­to­day activities. It is draws from the traditional branches of yoga such as Hatha Yoga, Karma Yoga, Bhakti & Mantra Yoga, Jnana Yoga and Raja Yoga and Yoga Nidra The benefits can be experienced on a mental, emotional, psychological and spiritual level. All guests are invited to participate in the variety of activities.Find out about the different levels of immersion and training for individuals and groups on your retreat options and about our daily schedule and other Daily ScheduleAt Anahata, yoga is more than physical exercise, it is a way of being, a way of living, an attitude with life and towards life, a yogic lifestyle. Yoga provides the tools to live a balanced, grounded and more centred life. These potentials dwell within you. Discover a stronger foundation of your self, renewed energy and a broader perspective of possibilities for your life.At Anahata we live, share and teach the yogic lifestyle. Our integral approach provides inspiration to enrich your life as well as valuable skills to take away & incorporate into your day-to-day activities. The benefits can be experienced on a mental, emotional, psychological and spiritual level. Anahata Opens my heart to the Universe. 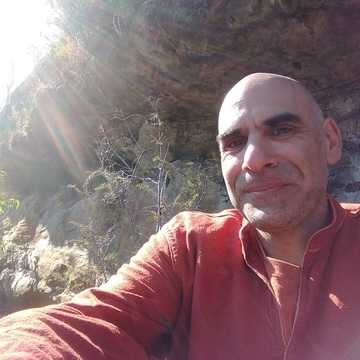 Swami Karma Karuna is a founding member and Director of Anahata Yoga Retreat, New Zealand, and a dedicated, intuitive yoga teacher with years of experience working with a wide range of people. 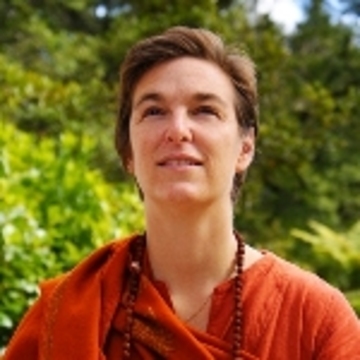 From an early age, she traveled exploring diverse spiritual traditions; finally dedicating herself to the yogic path, guided by Swami Niranjanananda Saraswati, world-wide head of the Satyananda Yoga Movement. 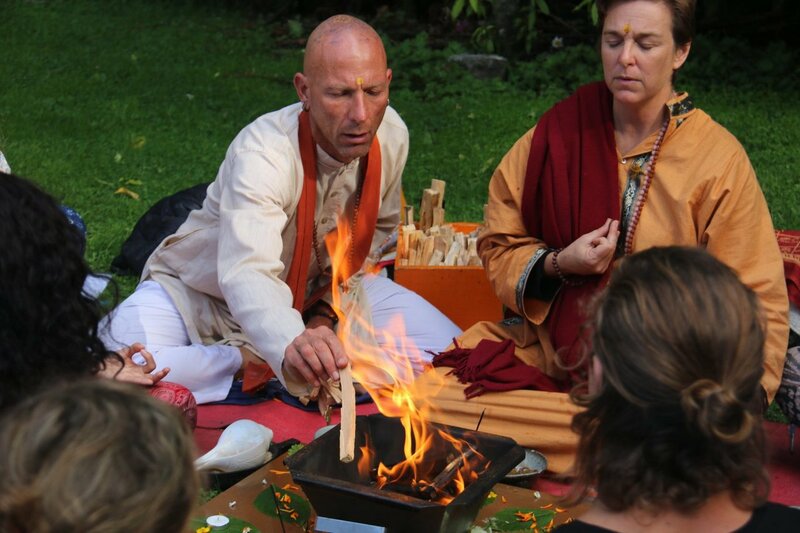 Swami Karma Karuna has received yoga training in Nepal, India and Australia. 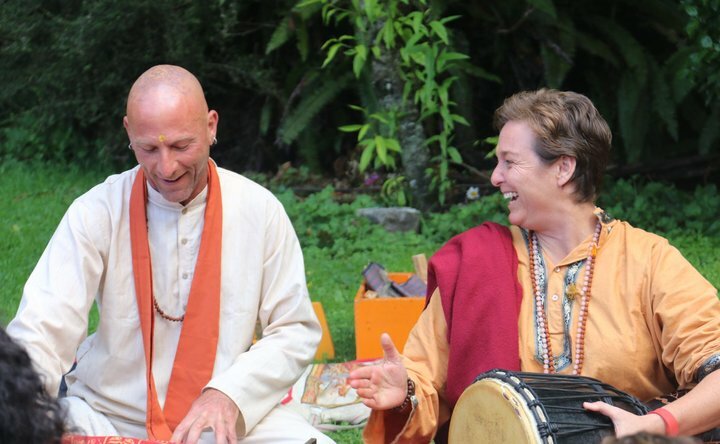 She spends 3 months each year living and teaching in India at the home and sadhana place of Swami Satyananda. She also travels internationally part of the year, committed to sharing Yoga Solutions for Life™ - simple & powerful techniques for transformation. 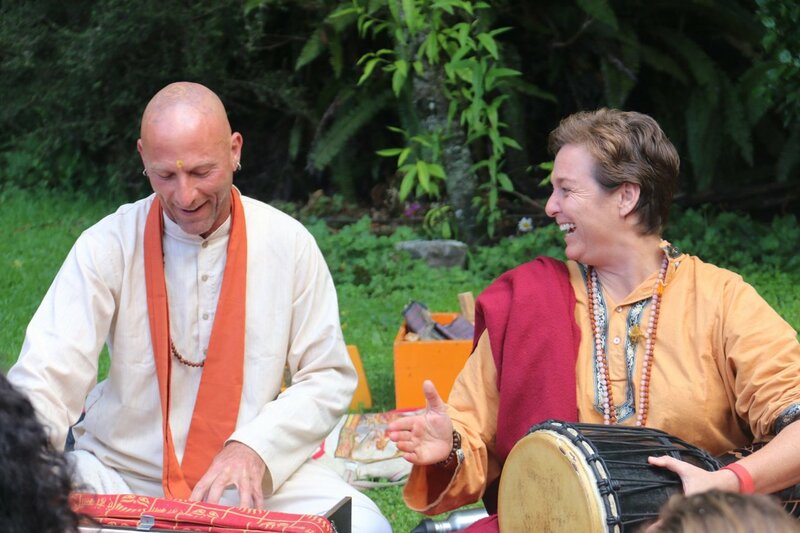 During past tours, Swami Karma Karuna has been involved in workshops, retreats, trained teacher trainees at the Australasian Satyananda Yoga Academy, and worked with groups of Yoga Therapists throughout the USA. 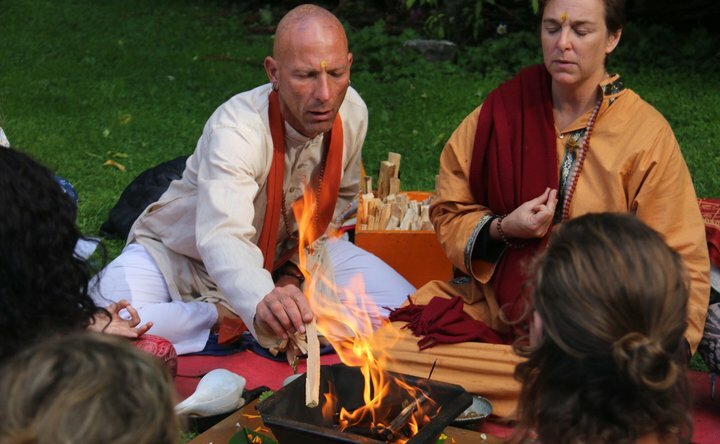 By combining yogic lifestyle and Sannyasa tradition with family life, Swami Karma Karuna has a unique and practical approach, inspiring the integration of yogic principles into everyday activities. In 2007 Swami Karma Karuna released her first yoga and meditation CD called Yoga Solutions for Life™ – Essential Daily and Deepening Practices designed to develop a simple daily practice enhancing health and relaxation. In October 2007, a second CD focused on the chakras and seed sounds was released.